A tropical paradise on the South Side, secluded East End of Cayman Brac. Our luxury ocean front, two bedroom condo offers stunning views and the highest standards at affordable prices. You will enjoy relaxing here at The Cayman Breakers, where the famous bluff is towering 140-feet high in the background. We are ideally located oceanfront. Enjoy relaxing in a hammock by the pool or using the barbeque grill and dining in the cabana area. The condo has a direct ocean view and offers central air, Internet TV, Wi-Fi, washer/dryer and all the comforts of home, including blender, toaster, coffee maker, DVD, CD player/stereo, linens, bath and beach towels, to name a few. The condo is a non-smoking unit and features a fully furnished kitchen with dishwasher, microwave and refrigerator with built-in ice-maker. It has tile throughout, central air conditioning, ceiling fans in every room and a walk-in laundry room. The grounds are meticulously landscaped with coconut trees and lush, tropical flora and vegetation, which is indigenous to the island and surrounds the property. Landscape lighting and beautiful rock walls provide a rich and dramatic background. Whether inside or out, the views, sights and sounds will captivate you. The sea wall, with steps that go down to the sea, make for easy access, as well as gearing up and down for divers. A rinse tank, drying racks and outside shower make it even more convenient. The views of the crystal clear Caribbean and the Bluff, with its sheer cliff rising 140 ft high, are magnificent. Oceanfront on the more desirable South (windward) Side, this luxury condo is located on the pristine East End of the island. The development is far away from all the noise and activity, so you can completely relax, making this a perfect getaway vacation. The Airport is only a 10 min. car ride away. Cayman Brac is 12 miles long and one and half miles wide, making it easy to get around. Car rentals are reasonably priced and recommended to get around easily. We provide free complimentary bikes, on premises, for our guests to ride. Take a bike ride to the end of the island to see where the Bluff meets the islands' end. Great Cave is there to explore as well. The views are breath taking! It's great for picture taking. We can assist with almost any need. We are divers and know the islands' best spots for snorkeling and diving. The condo has a booklet providing island information, including maps and phone numbers with local info. Cayman Brac is a safe and friendly place to visit. There's no crime. Come explore our caves, reefs, and Bluff - a true tropical paradise! We look forward to having you vacation with us here. Book your vacation today! See you soon. This luxury 2 bedroom condo has everything you'll need for the perfect vacation - along with shore diving, snorkeling, swimming, a pool, hammocks, and it's in close proximity to everything else the island has to offer. Get the best of both worlds...an ocean view and a view of the amazing Bluff. Located on the pristine South Side, East End of Cayman Brac, you'll find a peaceful, quiet destination to unwind and relax...away from all the noise. Complimentary dive flag and bicycles on site for our guests, provided on a first serve basis. We had an amazing time! There’s not enough space here for me to write just how great of a time we had! Thank you for offering your beautiful home, and I hope to come back one day. We're so glad you enjoyed your stay and look forward to having you come back again! Home away from home...Can I say more...yes, a lot really and all good too! It is a must go to place! Great for the bucket list as well! There are so many activities to enjoy on Cayman Brac. Go snorkeling, scuba diving, hiking, walk the nature trails, go rock-climbing, use the complimentary bicycles at the condo to ride to the end of the island where Great Cave and the famous Blow Hole are located. Explore the numerous caves on Cayman Brac. Go to the Museum. Chill out in a hammock and watch the breaking waves. 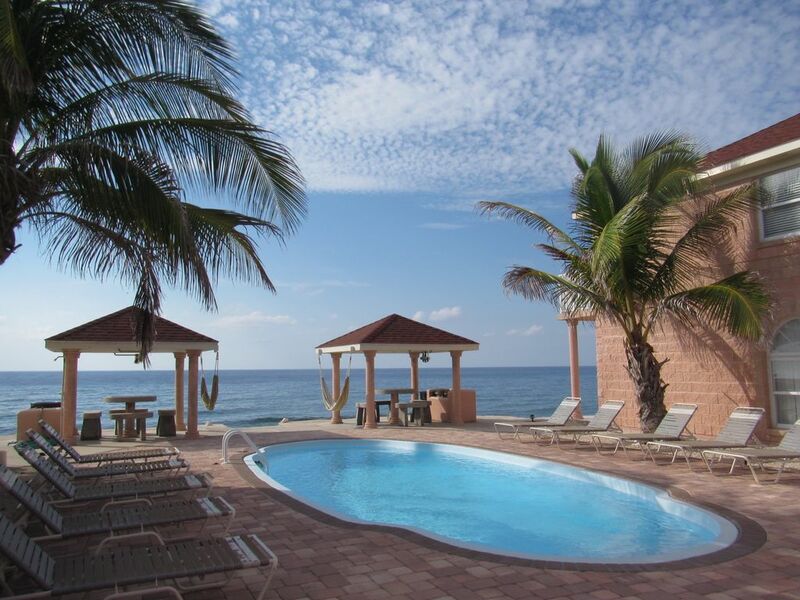 Swim in the freshwater pool, overlooking the Caribbean Sea. Our detailed information booklet on dive and snorkel sites and all the island information is located on the coffee table in the condo. Rates are subject to change until reservation is confirmed. Cancellation 30 days or more prior to planned arrival date, refund of 50% of deposit. Cancellation within 29 days of arrival date, deposit is forfeited.